Pump control in commercial buildings is primarily based on pressure. 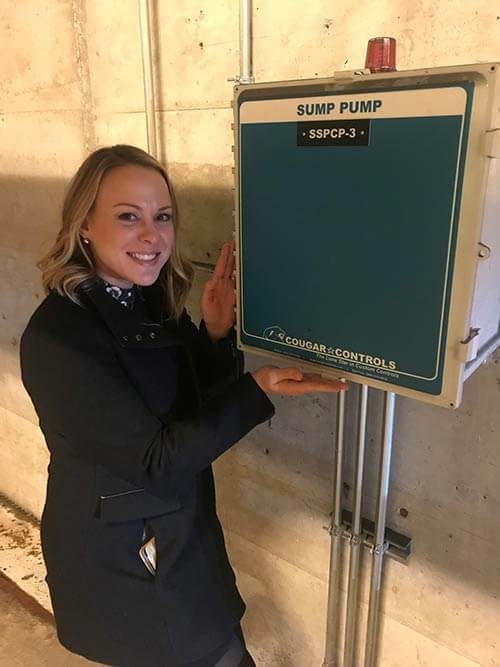 Domestic booster pump packages are designed to modulate pump speeds to maintain a constant discharge pressure to the building; Pressure Reducing Valves (PRVs) may also be required in the domestic water riser to safely distribute water to lower floors. In hydronic loops (for example, chilled water, heating hot water), differential pressure across the supply and return lines is used to control the pump speed to react to changes in the system. Pressure control is crucial in steam distribution systems. In most systems, steam is generated and distributed at a high pressure and then reduced at each point of use. PRVs and control valves are used to lower and maintain steam pressure to heat exchangers, sterilizers, etc. Pressure is also used for level control in water storage tanks and sump basins. A submersible pressure transducer is placed in the water at the bottom of the tank or basin. The transducer measures the pressure (weight) of the water in the tank or basin and this measurement is sent to a control panel using an analog signal (usually 4-20 mA). The control panel will convert the signal to inches and display the level of the water on the touchscreen. Pressure gauges are used in the piping to show system pressures. In Houston, the primary application for level control is domestic and fire break tanks or water storage tanks. The water level is measured with conductivity probes (single point) or pressure transducer (continuous) sensors installed in the tank. These level sensors communicate with a Level Control Panel that will control valves to refill the tank [and provide alarms for tank high and low level. Sump pump stations are controlled by level using float switches or pressure transducer installed in the basin. The floats or transducer work with a Sump Pump Control Panel to turn sump pumps on and pump down the basin. Cooling tower basins use level controls to make up water lost to drift and blowdown cycles. 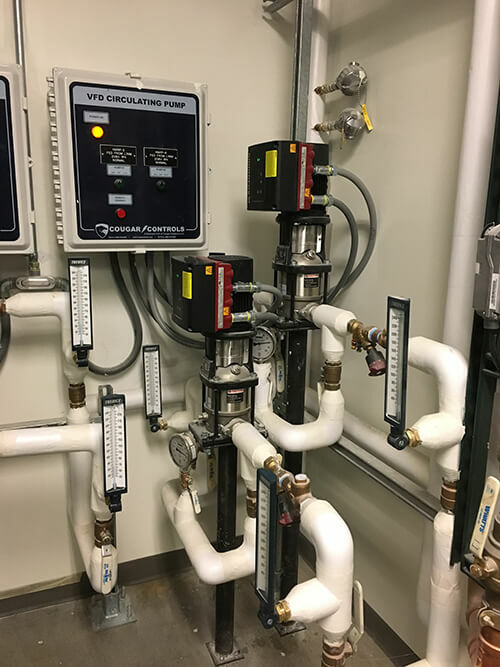 Most systems use a simple float valve; however, a continuous-level transmitter, electronic valve and control panel may be used for more complex systems (for example, multiple towers or basins). Condensate return systems use a tank with level controls to store condensate before pumping for re-use. In steam applications, the condensate from a heat exchanger or other process is collected and then pumped back to the boiler. In HVAC applications, condensate from air handlers and fan coil units is collected and then primarily pumped into the condenser water loop as make up water for the cooling tower. 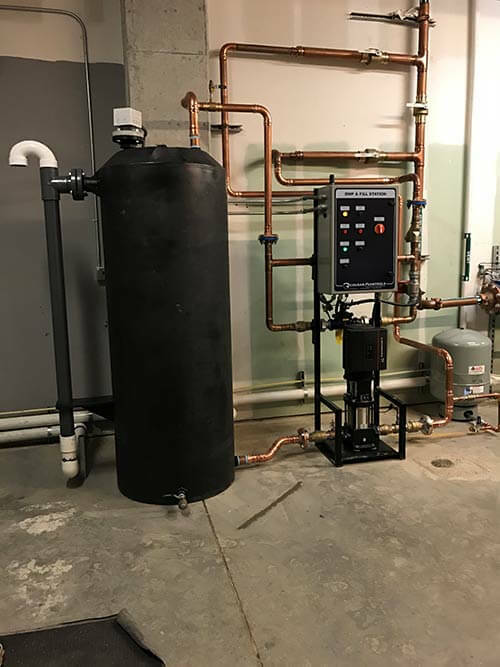 Domestic hot water is the largest temperature-control application on the plumbing side of a commercial building. Hot water heaters, either gas fired or steam fired, provide hot water for kitchens, restrooms, laundries, etc. within the building. 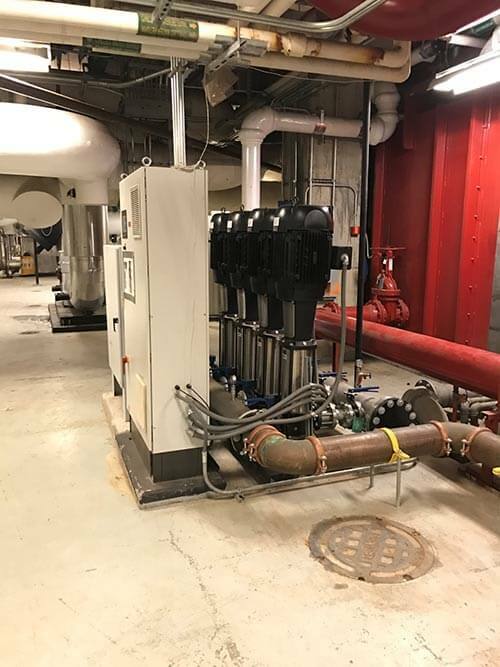 In some cases, the water is heated to high temperatures, around 140°F, to kill bacteria like legionella and then use a mixing valve to reduce the temperature back down below scalding before delivering out to the building. Most large domestic hot water systems include a return loop that always pumps water back to the water heaters and mixing valve to keep the water in the system hot. The branch lines of the piping require water flow or temperature balancing valves before joining the return loop. Temperature control is used in steam systems for steam flow into a heat exchanger; a control valve modulates steam to the exchanger based on the outlet water temperature. Many steam traps also use thermostatic elements to open and close. Primary hydronic loops use chillers, boilers, and cooling towers to maintain constant water temperatures for building cooling and heating. Secondary loops are used for specialty applications such as cooling MRIs or CRAC units. A heat exchanger is used between the primary and secondary Loops with the water flow controlled based on the outlet temperature of the secondary loop using a control valve or pump. Thermometers are used to see system temperatures. For domestic water booster pumps, a low flow shut down sequence allows the system to shut down during periods of little or no demand. The BoosterpaQ Controller calculates flow using the CU352 Controller. In some applications, a constant flow of water is required. 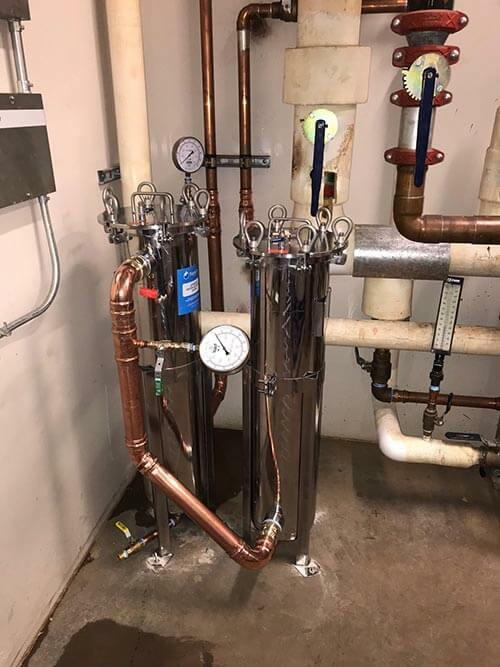 Coil kits and control valves are used at Fan Coil Units (FCUs) and Air Handling Units (AHUs) to maintain a constant water flow for heating and cooling applications. In domestic hot water return loops, flow balancing valves can be used on the branch lines before the return loop to maintain system balance. Flow-balancing valves are also used on pumps to limit their flow; this can also be done with a VFD or integral controller. Chilled and condenser water loops are designed to a flow rate per ton of cooling. Chilled water pumps are typically controlled by differential or proportional pressure, but condenser water pumps can be balanced with VFDs to maintain a constant flow. Flow meters can be used in steam or water systems when usage tracking is required. Flow meters are often installed on mechanical system make up or irrigation lines. Steam flow meters in large distribution systems (institutions, university campuses, etc.) can be used to meter consumption of each building or application. An ultrasonic flow meter is also used in our Pump Audit Kit to measure the flow of existing pump systems. In commercial buildings, legionella bacteria is a major concern that can be addressed in multiple ways. Filters can be used on incoming domestic water lines or at specific points of use like a coffee bar or ice maker. A clean storage tank can improve the system water quality as well. Domestic hot water is often heated to 140°F to kill the bacteria before being tempered back down with a mixing valve and delivered to the building. In condenser water loops for cooling towers, a side-stream filter can be used to catch and kill the legionella bacteria that can grow in the tower basins. In closed-loop applications (chilled water, heating hot water), air separators and dirt separators are used to improve the heat transfer in the system.